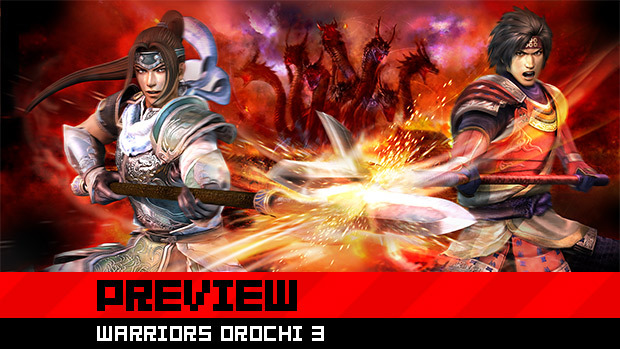 Koei's Warriors Orochi series has always been about fan service, explained Tecmo Koei's Sean Corcoran during a demo in New York last week. But it seems like developer Omega Force is really taking that ethos to heart this time around, to an almost ridiculous level. Corcoran laid out the key points of the game's story for me, and the best way I can summarize it is... aw, never mind, just look up "absurd" in a thesaurus. You're going to need those synonyms if you want to wrap your head around how insane -- or is it inane? -- this game is. 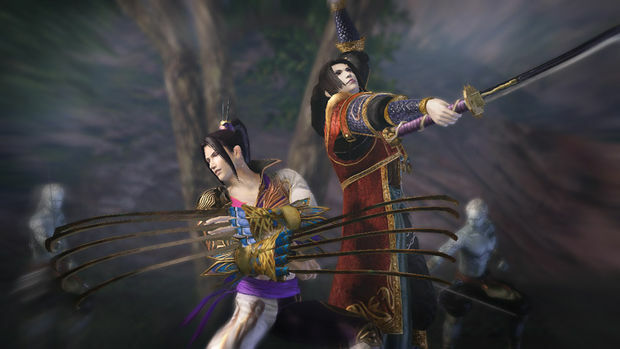 After vanquishing the Serpent King (in Warriors Orochi 2), our heroes -- the military leaders from Koei's Dynasty Warriors and Samurai Warriors series -- return to their territorial wars, endlessly clashing with each other for control of ancient China and Japan. Amid this chaos comes a mythical beast, an eight-headed serpent that lays waste to the warlords' homelands. Their ranks decimated by constant conflict, the remaining leaders are too few and too weak to put up much of a fight. When all hope appears to be lost, a "mysterious woman" named Kaguya arrives, bringing one chance at salvation. She explains that the men must travel back in time with her to unite with their former enemies and stand as one against the Hydra. Only then, Kaguya says, will humanity have a chance. Mythology, eh? That's the starting point for the game's Story Mode. The initial setup is reminiscent of Dynasty Warriors 7, except your "town" is the human forces' base camp on the night before the final showdown against the Hydra. Once you've selected three characters (from over 120 choices), you travel back in time to a particular battle. In each battle, you attempt to rewrite history in a way that will help your cause. You can switch between the members of your trio with R2 and L2, so it helps to have a diversified team. When a particular gauge is full, you can all engage in a "True Triple Attack," a devastating special combo. While both the Story Mode and Free Mode support co-op play, it's unfortunately limited to two players, not three. In the mission I played, the enemy trapped us inside a fortress and set it ablaze, leaving us for dead. But in this timeline, a side gate opened up, and we were able to escape and force the demon-warrior Shuten Doji to retreat. The game features an in-depth "bonds" system that has a significant effect on the story. Fighting alongside characters, or interacting with them in camp (by, for example, holding banquets), will strengthen your bond with them. Characters to whom you're bonded strongly will perform better in battle and may unlock special stages and attacks. In addition, your bonds and unlocks will affect which of the three story endings you see: Normal, Good, and True. Aside from co-op play, WO3 offers another online mode: Musou Battlefields. Here, you can edit battlefields from missions you've already completed, changing elements such as voice lines and music. 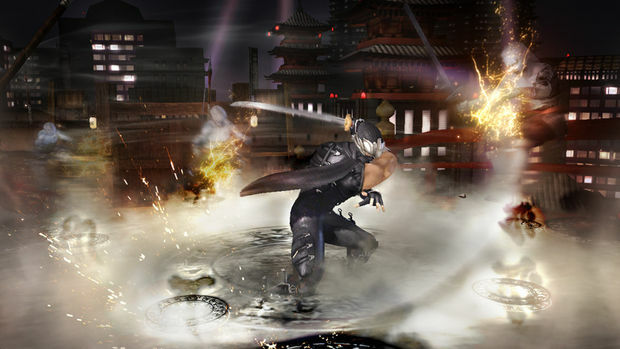 You can also choose how the mission itself will play out, altering the strength and number of the forces themselves, as well as the sequence of events during the fight. Having done all that, the game allows you to upload your masterpiece so other players can attempt to complete your stage. Now that I think about it, the preposterous storylines of the Warriors Orochi games make sense. 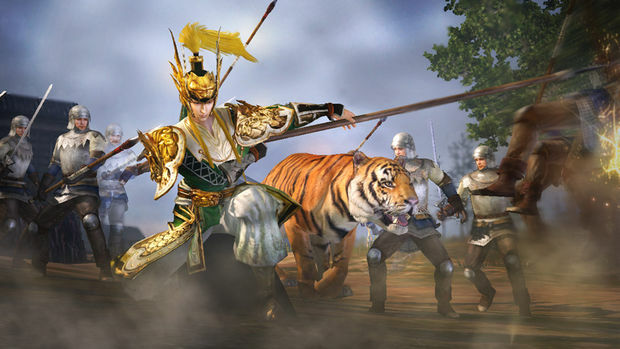 If you'd been playing Dynasty Warriors and Samurai Warriors titles for years, you were probably desperate for something to come along and break up the monotony. Warriors Orochi 3 looks like it will do that in a spectacular way; it's even bringing in characters from other Tecmo Koei games, like Ryu Hayabusa from Ninja Gaiden and Ayane of Dead or Alive fame. I salute your craziness, Tecmo Koei -- if you're going for madcap insanity, you might as well go all the way, right?